Tiger Rock is full of opportunities for activity........but I have to say, it also offers up the chance to do absolutely nothing at all! We have our tennis court which can be flood lit at night. This is popular with teenagers who seem to like starting their games at 11pm and playing until 2am. All we ask is that you bring along appropriate footware to play on the court. Any sneakers will do and we have a selection of rackets and balls that you can use. There is a small charge for the use of the court and equipment. Tiger Rock is in the jungle and we have plenty of birds species and not many mammals. Bird waters will be very happy - the highlights are the hornbills- there are several species on the island the most common the Southern Pied Hornbill but The greater hornbill is often in the trees. It is a huge bird. The Rhinocerous Hornbill is also often seen as is the Wreathed Hornbill. We are delighted that we have the Greater Argus Pheasant on Pangkor. It is an extremely shy bird which is very rarely seen but we hear it all the time. Its calls can be heard throughout the property but it likes to stay behind the Studio and Hill House where it can call quite loudly in the middle of the night. We also have our resident pair of Fish Owls which call and hoot all over the place. The island supports a large variety of birds, many of which can be seen at Tiger Rock. For those who prefer to relax around the pool, we now have lady who will come in & decorate your hands & feet with henna in the traditional Indian style. Anyone can go home looking ultra exotic with tan & delicately decorated hands. A great fashion accessory. Mohan can make arrangements and give the rates. We can also call in the massage man and his wife who give traditional massage. Again Mohan can make arrangements and give you the rates. For children and adults, Mohan is happy to show you how to tap a rubber tree. Tiger Rock still has many old rubber trees from the original small holding. you can also have a go at the traditional tapping, and watch the white latex drip into a small rubber cup. Bavanni is also happy for you to watch her cook in the kitchen if you are interested. This way you can go home and try to make the same dishes. 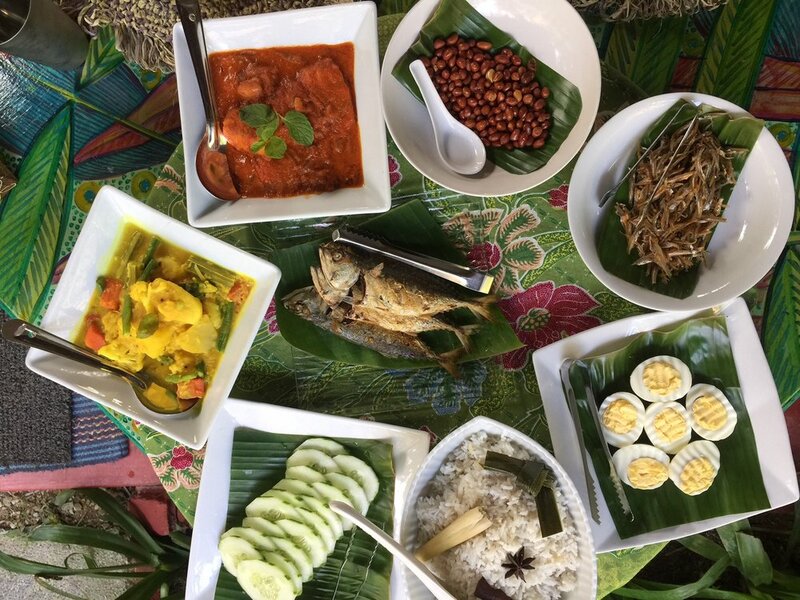 Bavanni's tomato chutney and the fried ikan bilis with onions and lime are some of the favourites that guests like to learn. Mohan will also happily give you a tour of the property so that you can see the other houses and rooms. For the artist in you, inspiration is everywhere! Paints are provided.